I am continually on the lookout for hair products that moisturize my hair and enhance my curls. Wearing my hair curly leaves it feeling dry and brittle and straightening it leaves it damaged and frizzy. Each month I will be using a different hair product and blogging about it here. 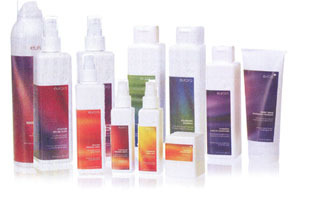 This month I am using a shampoo and conditioner called Eufora. You can learn about it here http://www.eufora.net/trulyeufora.htm. I was drawn to this product because instead of using water as its base, it uses certified organic Aloe Vera gel. Aloe is known for its healing, renewal and growth qualities. It is also packed with vitamins that are essential in restoring damage. I have used this product for a week and so far I really like it. The smell is pleasant, not overpowering. I step out of the shower with silky hair (which is a must for curls). When it dries, my hair feels soft and looks vibrant. My one complaint is the packaging. It seems a bit amateur but honestly, its whats inside that counts. You can find this product at some salons and the price is very reasonable.